Remember I said we had a lot of figs? I love them. We desperately want to find awesome things to do with them so we can enjoy them to their fullest! We picked some the other weekend and we ended up with quite a few our baskets that were not quite ripe. (Turns out husband wasn't quite sure what they look like ripe--oops.) They ripen a little bit in a day or two if you keep them on the counter, but after that they start to go bad. I made some savory fig jam with onion and spices (amazing on pork from our hog share!! ), and I made some fig leather (thinking that dehydrating them would concentrate the sweetness), but it ended up really tough and chewy. So I had an idea. 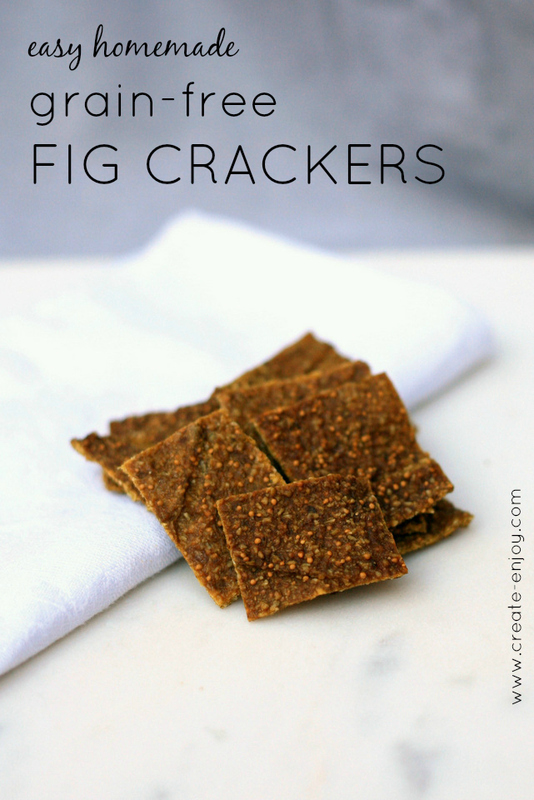 The fig leather process was a lot like a homemade cracker recipe process (I've made a lot of dehydrated grain-free nut crackers in the past), so why not make a fig leather-cracker hybrid? 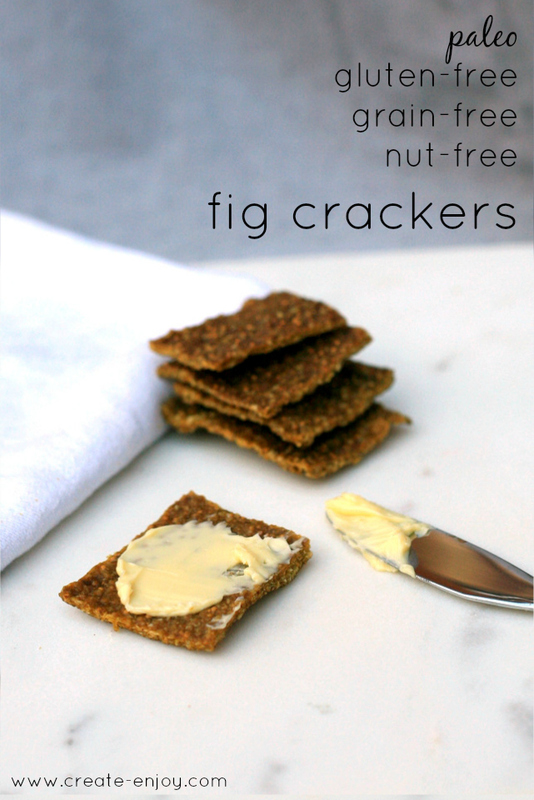 I could add something nutty with some fat and softness to keep them from being so crispy and tough, and the very light sweetness of the not-quite-ripe figs could make for a really nice dessert "cracker." Like something you'd eat with brie or goat cheese or a little bit of fancy jam. It sounds weird, but they turned out much better than I could have imagined! Husband (who doesn't like figs much at all) is asking for more. Plus, they're a great vessel for butter or almond butter, and since I don't eat bread, always nice to have something to spread one of those on when I need a high-energy treat or snack. I also love that these are practically 1-step. You'll start by making your own sunflower seed flour/meal (like I do in this amazing recipe--see how to make nut flour or nut butter here), then add coconut and whole figs. No chopping or anything, just pull off the stems. So easy! Add the unsweetened dried coconut and pulse until mixed. Scrape the sides and corners of the food processor. Add figs whole (I almost filled our 9-cup food processor with figs, so I think I used about 8 cups). I've found the mixture is too liquid to go straight to the dehydrator, so pour in medium-thick layers onto cookie sheets with parchment paper liners. (I've used two cookie sheets for one batch). Bake at 200 degrees for 1-2 hours, until it is dry enough to be pried up. These are actually nut-free (except the coconut) as well as grain-free and gluten-free, since I used sunflower seeds (they're so easy to blend, have a nice nutty flavor, and are very affordable in the bulk section--just make sure you store them in the fridge to keep them from going rancid). The sunflower seeds also made them taste like a bread my mom bought when I was growing up. I don't miss bread, but the familiar taste does make these taste extra good with butter on top! No, like, I literally just spread butter on them. Unsalted Kerrygold butter from grassfed cows, to be exact. I love putting butter on things. Let me know if you try any variations, how yours turn out! good idea:) I don't have any figs but I might try this idea with persimmons in a couple of months. Love this idea. I never would have ever thought to do that with figs! Clever- and even better that the hubby approved. quality breast shapers. Do you have issues if you wear a strapless dress? Although I'm not a paleo eater myself, I am really enjoying the variety and innovation that the paleo movement is bringing to my cooking. Thanks for sharing this one! Ooh, interesting! Persimmons are so cool! That's awesome! Yes, at its core all Paleo really is is high quality, unprocessed, real food prepared in delicious ways!